EU foreign policy chief said she was cautiously optimistic over the outcome of talks this week between Iran and world powers. 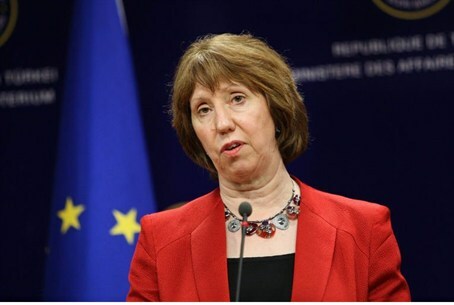 EU foreign policy chief Catherine Ashton said Wednesday she was cautiously optimistic over the outcome of talks this week between Iran and world powers on Tehran's nuclear drive, AFP reports. The comments came as officials from the so-called P5+1 group prepare to meet negotiators from Iran in Kazakhstan on Friday, hoping for a response to a revised offer that would ease some sanctions in return for concessions over Iran’s uranium enrichment activities. "We go to Almaty ready now to hear formally the response from Iran," said Ashton, chief negotiator for the P5+1 -- the five permanent members of the UN Security Council plus Germany. "I remain always cautiously optimistic but I'm also very clear that it's very important to get a response," she said at a joint news conference in Ankara with Turkish Foreign Minister Ahmet Davutoglu, according to AFP. "I look forward to what I hope will be a successful meeting in Almaty and I really do hope that Iran will now... consider the proposal we put on the table and respond to it," said Ashton. Davutoglu said Turkey, which has hosted nuclear negotiations in the past, was closely following the developments and was "ready to contribute to a solution". Turkey, which is heavily dependent on oil and natural gas imports from Tehran, says Iran has the right to acquire nuclear technology for peaceful purposes. It abides by UN sanctions against Tehran but opposes unilateral measures taken by the European Union and the United States. Iran and the P5+1 resumed discussions over the decade-old dispute late February after a months-long break and failed meetings in Istanbul, Baghdad and Moscow. The offer proposed by the P5+1 during those talks reportedly involves easing sanctions on Iran's gold and precious metals trade and lifting some very small banking operations. In return, it demands a tougher nuclear inspection regime and the interruption of enrichment operations at the Fordow bunker facility where 20-percent enrichment goes on. The talks were praised by Tehran as a possible turning point in the dispute. Reports last week indicated that diplomatic sources are weighing a new offer from Iran, that would see it freeze its enrichment of uranium at a level of 20 percent for six months. In exchange, Iran would demand an easing of the sanctions imposed by Western countries over its refusal to allow full outside oversight of its nuclear program. Before his recent trip to Israel, U.S. President Barack Obama said Iran was "over a year or so" from getting a nuclear bomb, warning that the military option remained on the table. "We think that it would take over a year or so for Iran to actually develop a nuclear weapon, but obviously, we don't want to cut it too close," he said in an interview with Israel's Channel 2 television. The United Nations’ nuclear agency, meanwhile, reported Wednesday that Iran appears to be working on an atomic weapon of mass destruction.